I wasn't very sure how I should go about preparing this meal because we don't have fresh milk and I'd rather not open up a big packet of whipping cream just to use a small cup, nor I want to add any tomato paste (as suggested by DinoPapa) to it and we ran out of any creamy canned soup! Gosh! I was exasperated!!! Is this Mama not going to have her cheesy bake rice and get her cravings settled!?!? Searched all the food cabinets and drawers only to find a packet of clam chowder cup soup. That will do I gathered. Mixed that up with hot water and added a scoop of DinoBoy's formula milk coz I was afraid its won't be as creamy enough. After that I went about the preparation; cook rice in the rice cooker, threw in 3/4 cube of chicken stock (leftover from previous cooking), 2 salmon fillets sliced to bite size, 10 prawns, shelled and deveined, roughly sliced up abalone mushroom (I only have them in the fridge so they will do). Viola~ the baked rice is done! To perfection if I may say so, mighty proud of myself. Let's take a look at the inside of the baked rice. 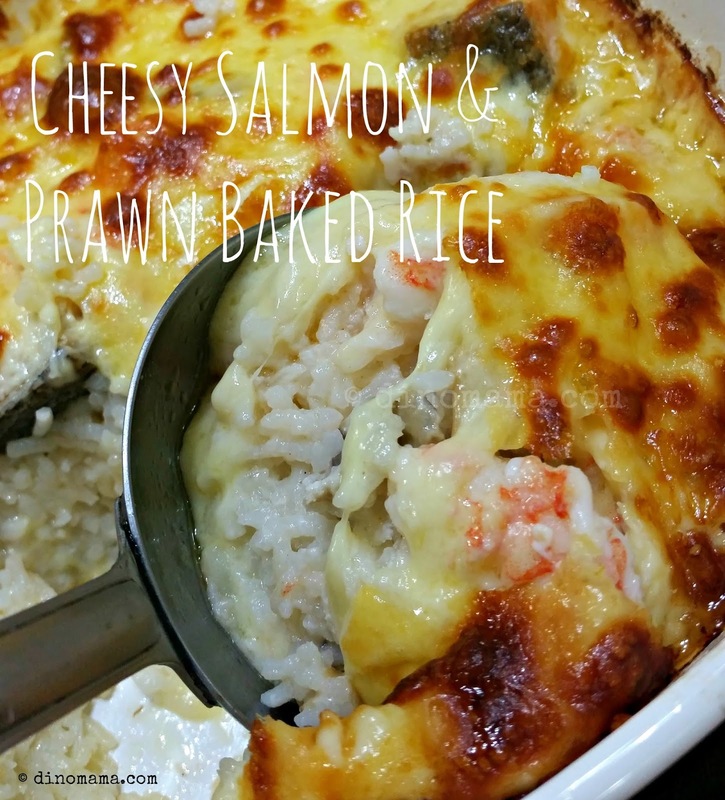 There's cheese every where with the soft and buttery rice, fresh salmon and prawns completes it and we are 3 very satisfied people. I was looking for Tabasco sauce in the fridge to go with this baked rice but after tasting it I think that sauce will spoil the goodness of it. Some tips on cooking of the rice, I cooked mine using the usual method; means the same amount of water as I would for cooking steaming white rice. With the added liquid later the rice was soft, if you prefer your rice to be a little bit hard and with texture, add slightly lesser water to cook in the rice cooker, perhaps use half a can of creamy soup instead of one. 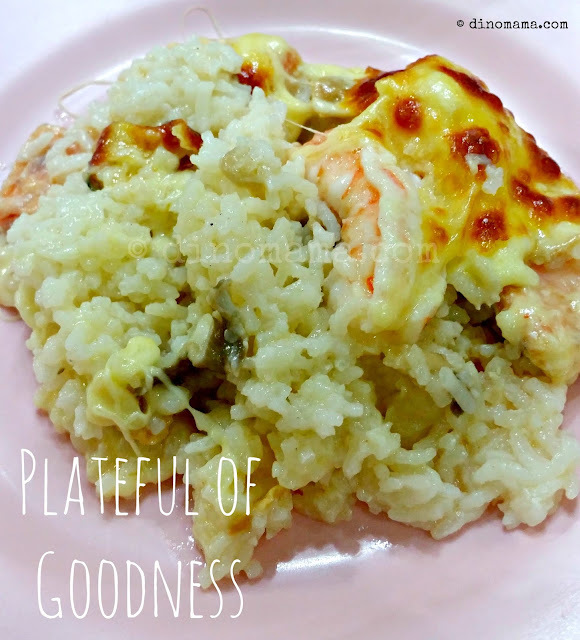 I hope my Salmon & Prawn Baked Rice inspired you to cook it and have it with your family. Do share with us photo of your baked rice if you are making it. Till the next Foodie Friday post, Cheers and Happy Cooking! 1. Cook rice with slightly lesser water than usual, add in the chicken stock cube if you are using. 2. Heat up the canned creamy soup. 3. Preheat oven to 180 Deg. 4. Melt butter in the oven proof dish over low heat, add in mushrooms and onions to sauté till mushrooms are soft and onions are translucent. 5. Add the cooked rice and mix them up with the ingredients, at the same time coat the rice with the butter oil. 6. Mix in the salmon, prawns, squid or any other seafood into it. 7. Pour the creamy soup all over the dish, ensuring to cover every part of the rice. 8. 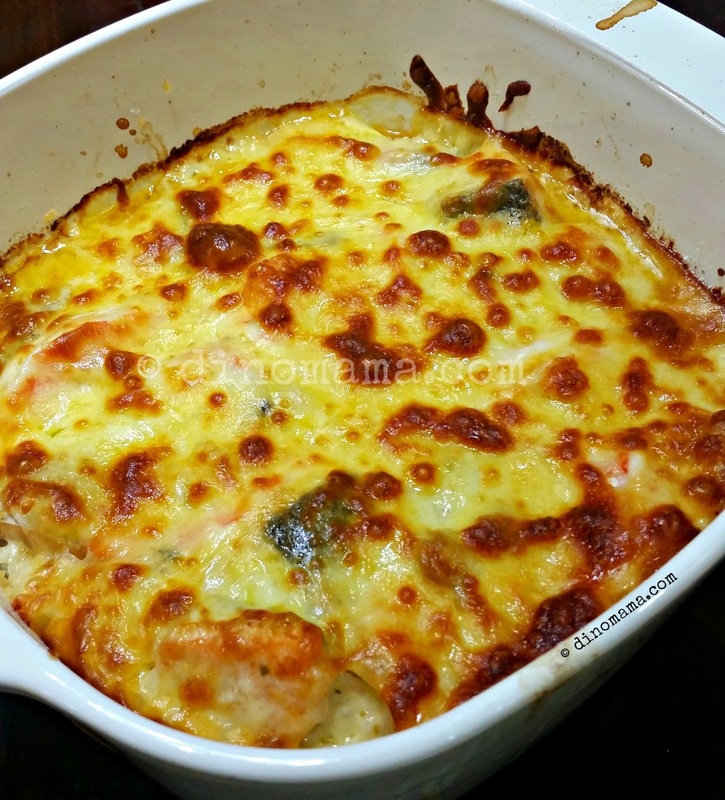 Add in the cheese and put the dish into the oven to bake for 20 to 25 mins.